When we first started researching for our trip to Japan, I was immediately taken with the idea of staying in a ryokan, a Japanese traditional inn. I wanted to have that cultural immersion experience of tatami floors, sleeping on futons, eating kaiseki meals and bathing in an onsen. But could we stay in a ryokan with kids? The Japanese are renowned for their serene and quiet demeanor, which does not meld with my loud and playful children. Not quickly deterred, I decided we could make it work with the kids. I started researching more and realized that the cost to stay in ryokans is quite high and I was having trouble finding a ryokan in our budget. Breakfast and dinner are usually included in your nightly rate at a ryokan, but still the prices were very high for our family of 5. The average price of a ryokan stay is 15,000-25,000 yen/person ($140-240 USD/person) – YIKES! Eventually I found Gion Shinmonso in Kyoto that would be a splurge for us, but we could swing it for one night. I didn’t know if we would ever be back to Japan and I knew staying in a ryokan was an experience I really wanted to have. 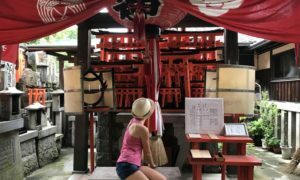 You can read all about our time in Kyoto with kids in this post. 1 What is a Ryokan? 9.0.1 Enjoyed Reading this Post? SIGN UP for more. A ryokan is a traditional Japanese inn that has existed for hundreds of years. It features tatami mat flooring, communal bathing facilities, and seasonally prepared meals. Ryokans are most common outside of major cities, often in scenic areas known for their hot springs. They are popular with both domestic travelers and increasingly, with tourists. 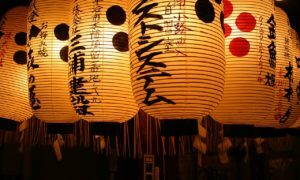 Japan is a society ruled by clearly defined etiquette and it can be scary for a first time visitor to try to navigate the etiquette of staying in a ryokan. Especially if you have young, loud, and active children with you. So should you risk it with kids? Definitely! 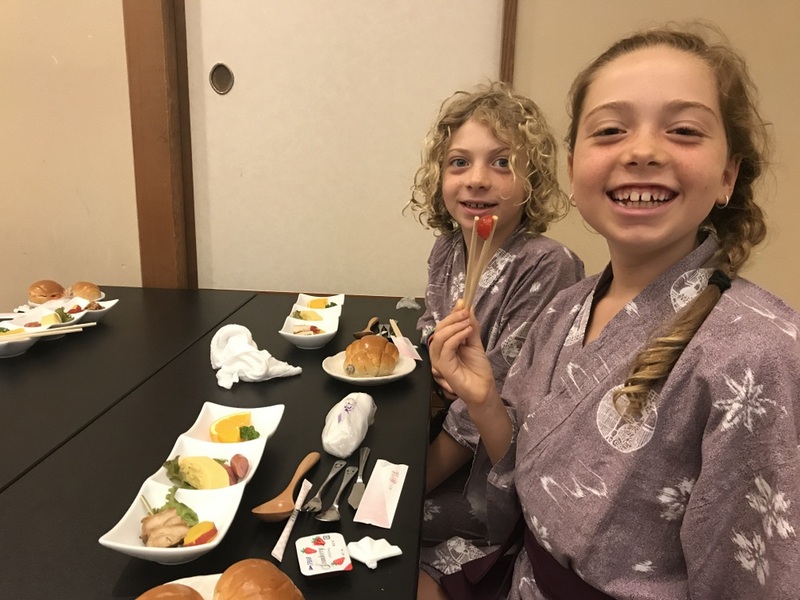 It is such a unique experience and our kids loved all the new experiences – wearing a yukata, eating weird foods, sleeping on futons on the floor and naked bathing in the onsen. I had done some reading before our arrival about the dos and don’t of a ryokan stay and our ryokan also had an English “manual” in the room. This gave me the confidence to feel like we wouldn’t make any major faux pas during our stay. If this is your first time to Japan and you are covering Kyoto and Tokyo like we did, Kyoto makes a wonderful place to experience a ryokan. With its narrow streets, traditional architecture and slower pace of life, Kyoto has many ryokans to choose from. Another popular ryokan destination is Hakone, outside Tokyo, where the natural hot springs lure city dwellers out of the city. When we arrived we were shown to our room, which was a standard sized room suitable for 2-6 people. Since we were in Kyoto and we had chosen a ryokan that catered to both Japanese and foreign visitors, the hostess spoke a fair amount of English. Like everywhere in Japan, before you enter the room, you take off your shoes. The ryokan provides slippers that you can use throughout the inn. Make sure to not bring wheely bags onto the tatami flooring as they can damage the floor. When we entered our room, the hostess pointed out the amenities like the yukatas you are given to wear during your stay. We had tea and traditional cookies waiting for us on the table. The kids were very happy to see a television set in the room, which we did use briefly. A ryokan room is a multi-purpose room that functions as your sleep space, dining area and relaxation area. The floors are covered with tatami mats and there are sliding rice paper doors. These are delicate and so our wrestling and energetic kids were warned about not getting close to them. Luckily, our ryokan had solid walls and we had no issues with sound between the rooms. The daytime set up of the room consisted of a short table with pillow seats on the floor. We had our own private bathroom, which featured one of those fancy Japanese toilets. The kids loved testing out all the different types of washes and music. Through rice paper sliding doors we had a small sitting area with two raised chairs. We changed right away into our yukatas (keep your undergarments on) and had a lovely relaxing tea as a family. Our kids got really into tea while we were in India where they loved drinking the milky, sweet Chai. We played some cards and relaxed before dinner. An onsen is a communal bathing area, often part of a ryokan. 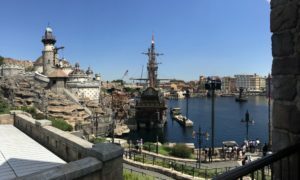 It was another one of those experiences that I was keen to have while we were in Japan. The baths are divided by gender and you cannot wear a swim suit while bathing. Some welcome kids, while others do not. If you have tattoos you are generally not welcome in the onsen because they are seen as a symbol of the Japanese mafia. Make sure you ask in advance. I had talked to the kids before we arrived about what an onsen is and how it works. Understandably they weren’t super keen on going naked into the communal baths. They had gotten pretty used to being shushed a lot while we were in Japan and again I warned them that an onsen is not a boisterous swimming pool, but a quiet place of relaxation. We had some time before dinner, so we decided to head down to the first floor of our ryokan to use the onsen. Since we were divided along gender lines, I had the easy task of bathing with our 9 year old daughter. Paul drew the short end of the straw and had to bathe with our two rambunctious boys. We wore our yukatas and slippers down to the onsen, carrying the provided large towel and smaller towel. These towels are important. The large one is for drying off when you are done and the small one is used to shower before you enter the bath. You undress and keep your clothes in the baskets or lockers before entering the shower and bath area. The bath was a small, shallow pool and we were extremely happy to see no other bathers. Following the instructions we had read about, we sat on the tiny stools and using the soaps provided and small towel, we washed thoroughly. It definitely feels foreign strutting around naked in a semi-public place, but you get used to it. It definitely helped that we were alone for now. The bath or hot springs are extremely hot and lovely to relax in after a day of sightseeing. While we were soaking, we were joined by some Japanese women and it really wasn’t too bad. After we couldn’t handle the heat anymore, we self consciously walked to get our belongings and dry off. Success! Ella loved the nice lotions they had available and we felt cozy and refreshed. We enjoyed the onsen so much that we went back the following morning and once again had the place to ourselves. You sit on these little stools and wash thoroughly before entering the water. We had eaten sushi, ramen, udon, and tempura already while in Japan, but were eager to try the kaiseki cuisine of the ryokans. Kaiseki refers to small, varied and seasonal dishes that are artfully prepared and plated. This was one of our 7 food highlights of our trip to Japan. You select a dining time and your dinner is usually served in your room. You eat sitting on the ground at the table in your room. Since my husband and I are vegetarian, we requested a vegetarian meal when we checked in, which stressed out the woman quite a bit. We explained that we could eat fish, to which she visibly relaxed. Japan is not a vegetarian-friendly destination we had already discovered! The children had special kids meals that were still Japanese but featured a cute plate and more kid-friendly foods. Our kids are pretty flexible eaters and the food was totally fine for them. Our meal consisted of 1-2 small dishes brought to us every 10 minutes. It was definitely a game of guess what that food item is as there were many things we had never seen or tasted before. Often we would taste an item and it would taste surprisingly different then we expected. Did we like our kaiseki dinner? It was a great experience with lots of laughs, but I can’t say I loved the food. I think like anything in life you have to try new things numerous times before you get used to them. For breakfast, we had also picked a time to eat when we checked in. Breakfast was served in a dining room and once again the kids had special meals for them. We were confronted with a charcoal grill and some tiny fish and a few other small dishes. Again, there was lots of giggling as we tried to guess what we were eating and put our little fishies on the grill. After we were done our dinner and the food was cleared away, two of the hostesses began the process of switching our room from the dining layout to the sleeping layout. They moved the table and cushions to the side and began laying out the futons on the floor. They laid out pillows and large, fluffy duvets. Since there were five of us, the futons took up most of the room. It kind of felt like a family sleep out on the floor, which the kids quite enjoyed. The futons and pillows were not very soft, but we slept fine. We paid 32,400 yen ($300 USD) for our night at Gion Shinmonso for our family of 5. For us, this was a big splurge, but it did include breakfast and dinner. I am so glad we got to have this cultural experience and it was definitely one of the highlights of the trip for us. Ryokan pricing is based on per person rates and they will charge different amounts for children of different ages. Some give children a greater discount then others, so it pays to shop around. Remember, that not all ryokans accept children, so check before you book. Use Tripadvisor to look at some of the best ryokans in Japan. Staying at a ryokan is not really kid-friendly, but neither is traveling in Japan. So would I recommend both? Yes! 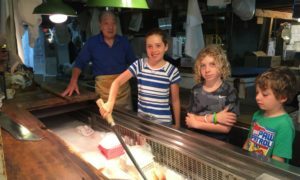 If you properly prepare your kids with what to expect, ryokan etiquette and emphasize this unique experience, the whole family will enjoy a ryokan stay . Try to choose a ryokan that caters to foreigners since there is more likely to be English spoken and they are used to helping visitors. We found Gion Shinmonso to be a good family friendly ryokan in Kyoto. Save this post for later. PIN it to Pinterest. great post! i’m traveling to kyoto with my party of 5 this spring. i’m struggling to book a ryokan. what website or agency did you use to book your ryokan? thanks! Hi Kate, I used Japanican to book our ryokan. It allowed me to book for a family of 5 with breakfast and dinner and was the most reasonable price I could find. Hopefully that works for you. It was such a highlight of our trip so I definitely recommend it!